Ahhh finally back. It's good to see my boat again. 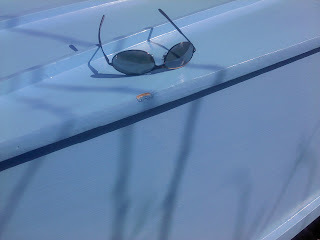 I found that the boat had gotten specks of mold on it as things left outside in FL will often tend to do. 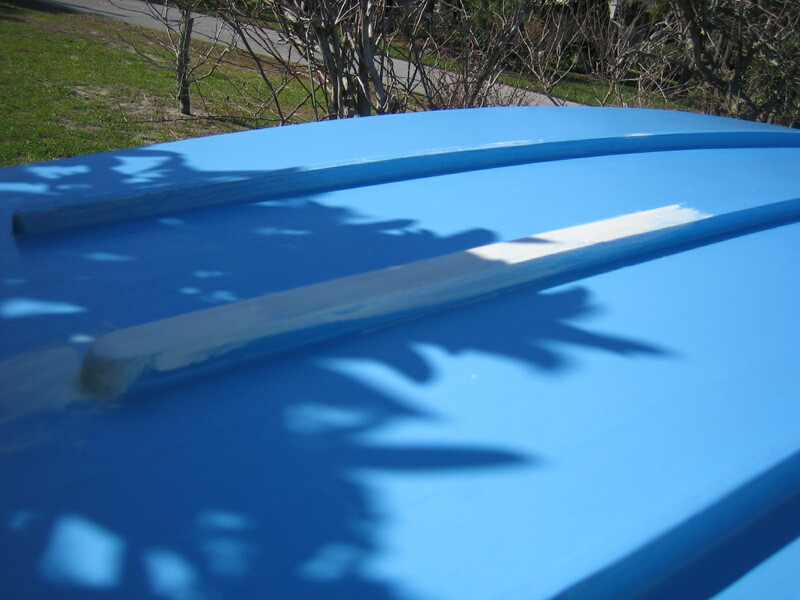 The boat was covered with tarp during the seven months I was gone but that did not prevent the mold. I may move the boat to a slightly less humid location in the future to see if the that helps. The mold washed off easily with bleach and water. 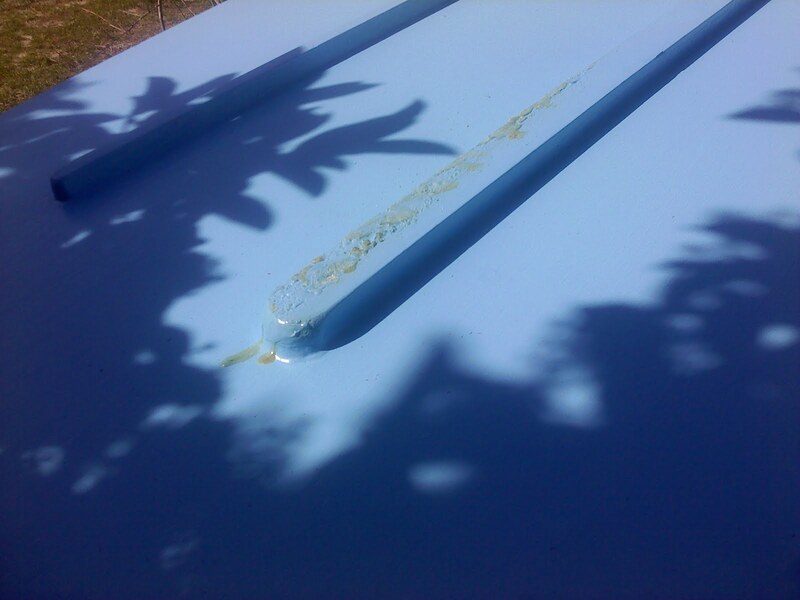 I also found a few problems with the paint on the outside surface of the hull. 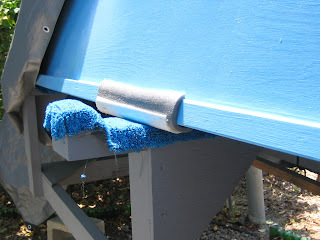 One problem as shown in this photo, was that the wood used for the center runner was green enough that in my absence sap had bubbled up through the paint. A more experienced wood worker would have probably known the wood was too green but not I. Another problem, as shown in this photo, was that some of the paint must have been put on too thick and did not dry fully. It seemed dry when we picked the boat up and put in on the trailer. The photo shows a bare spot of wood. This is from the strap used to secure the boat to the trailer. It looks like the paint wasn't cured and the strap was able to dig into the paint. So I inspected closely and found a few small problems in the paint on the outside of the hull and decided to give the hull a light sanding and another coat of paint. 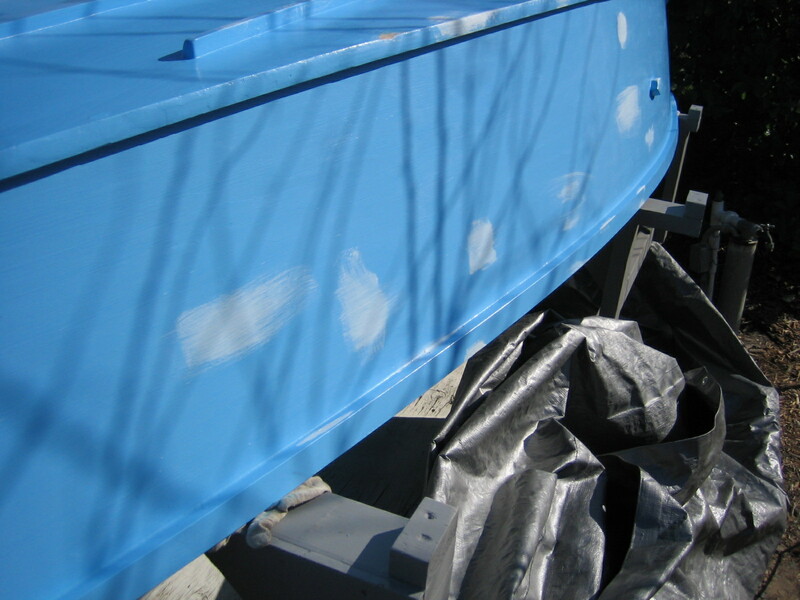 A photo of the runner in primer. The sap scraped and sanded off pretty easily. Not a bad job at all. 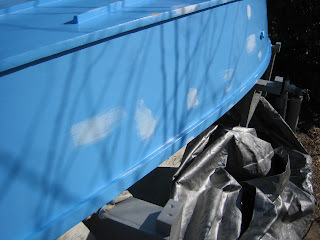 This photo shows a few spots in primer. I painted the hull with better paint from my favorite paint store and was careful not to coat too thickly. So the hull is now repainted and ready to go again. I'll have to keep an eye on the sap situation on the center runner. I hope it's all sapped out. Not a biggy if not though. I added indoor outdoor carpet to the 2X4 bunks the boat actually contacts while resting on the trailer. This is too protect the paint on the boat from the abrasion that occurs when I slide the boat on and off the trailer. 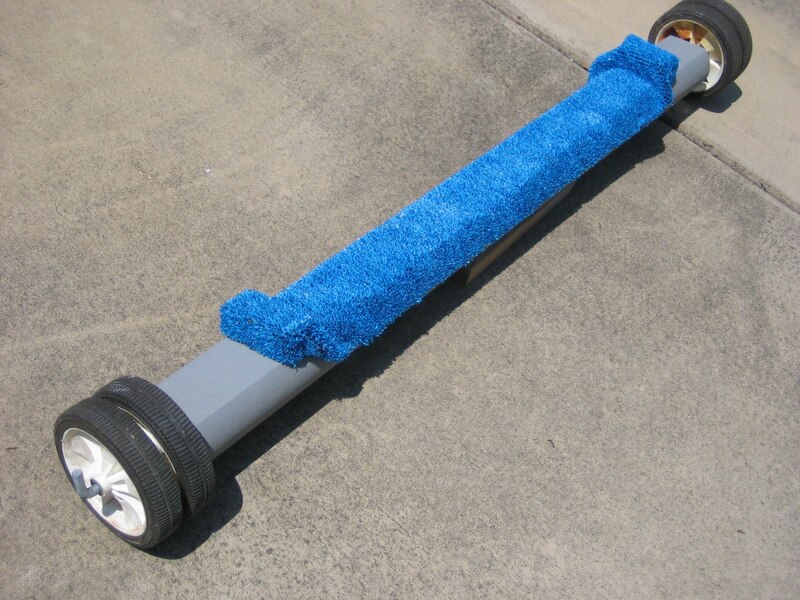 I also cooked up a piece of pvc pipe with a foam pipe insulation insert to further protect the boat and make sliding the boat off the trailer easier. Haven't tried it yet so lets call it experimental for now.